Oh, come on, it's only 20-25 inches for Alabama. Weather geek and a storm spotter in West Austin. Not a degreed meteorologist. Big snow fan. Love rain and cold! Despise heat! sphelps8681 wrote: Rented a cabin in Nacogdoches. We will be arriving the 18th. Any signs we may get snow/sleet/freezing rain? Will be leaving to go back home on the 21st. Need to know how to pack. it's possible but too early to tell. All guidance point to an impactful system that will bring rain and thunderstorms at the very least followed by and with cold air within the time period you posted. Timing of course is tbd. If packing I'd take all necessary supplies. I agree with ThunderSleet, hopeful for the coming weeks. Our best storms come around this time! I know things change on a constant basis. But hey the Farmers Almanac calls for winter snow/mix during that time period. Gotta be true!! LOL!! So what's changed? Well the Pacific. We finally got the tropical convection to move out of the maritime continent and into the Pacific. That allowed the subtropical jet to come back roaring. Now we are looking at an AEJ extension which is pushing along the MJO into the P7-8-1-2 through later Feb and early March. We've been looping in the same 6-7 phases for over a month without much movement. What does that all mean? It means the Pacific Northwest trough gets flushed also down to the Southern Rockies and out into the Southern Plains. This is likely our last real shot for a comeback, it's game over if this fails. Perhaps wxman57's wall is cracking. So far it's been bend but don't break. For me though, my intrigue is always with ENSO. The subtropical jet's strength coupled with what is now happening over the tropical Pacific is like a golden nugget. Highly anomalous, much like early 2015 not for the snow but the extreme OLR and WWB. It will be a fascinating few months in the ENSO world. GOES 17 will be lit up for us to watch the Pineapple Express flex. Ntxw wrote: So what's changed? Well the Pacific. We finally got the tropical convection to move out of the maritime continent and into the Pacific. That allowed the subtropical jet to come back roaring. Now we are looking at an AEJ extension which is pushing along the MJO into the P7-8-1-2 through later Feb and early March. We've been looping in the same 6-7 phases for over a month without much movement. What does that all mean? It means the Pacific Northwest trough gets flushed also down to the Southern Rockies and out into the Southern Plains. This is likely our last real shot for a comeback, it's game over if this fails. Time to break out the C4, bourbon and bad decision making. In Porta’s well documented case, an extra large bottle of Goose! BUILD POLAR BRIDGES NOT CANADIAN WALLS! I hibernate when it gets above 75 degrees! Here's a view of GOES 17 (west) on CIRA. Pacific is angry and on the far left near the EQ is 92P trying to become a tropical cyclone in the CPAC. EPAC may start it's ACE year early. Agreed...but the trends still look good imo AND it drops another massive snowstorm on the 25th. Winter’s whispers are slowly murmuring louder. I’m an aspiring meteorologist who usually only speaks in layman’s terms. Any forecast or discussion I say is purely of my own opinion and should only be taken as such. I just want one of these storms to be inside 5 days... is that so hard? weeklies were very dry but I don't buy it! Is this referencing our system for Monday of next week? Let's play a Facebook click bait game but without the ads. 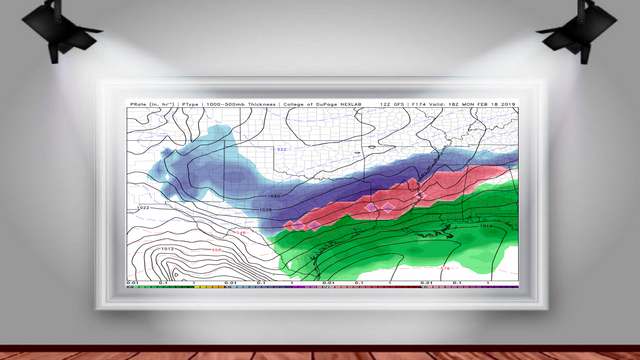 "Only one in 100 meteorologists can spot the anomalous GFS run (as far as snowfall in Texas) for next Monday. Are you a genius?" wxman57 wrote: Let's play a Facebook game. "Only one in 100 meteorologists can spot the anomalous GFS run for next Monday. Are you a genius?" Ok, let's play another game...Count the number of GFS Ensemble members showing accumulating snow for DFW in the picture ? The GFS 2m temperature forecast (from 12Z yesterday) for next Tuesday morning is so different from every other runs that it's hard to explain. What factor(s) led to this vastly different solution? Different (can't call it bad until we see if it verifies) initialization data? 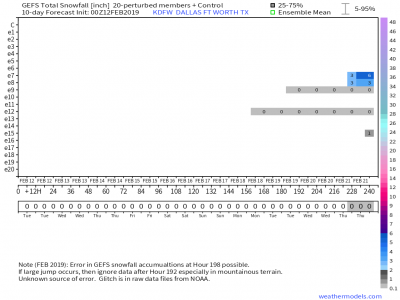 Yeah, and the 00Z GFS ensembles had 4 members with snow in DFW. GFS is all over the place each run. 00Z Euro has 32 as the coldest temp in DFW next week (Wednesday). I think we need to wait until this weekend's model runs to see more agreement. Well what's the fun in that ? Long range forecasting is no more than gambling in Vegas...up for a wager ?